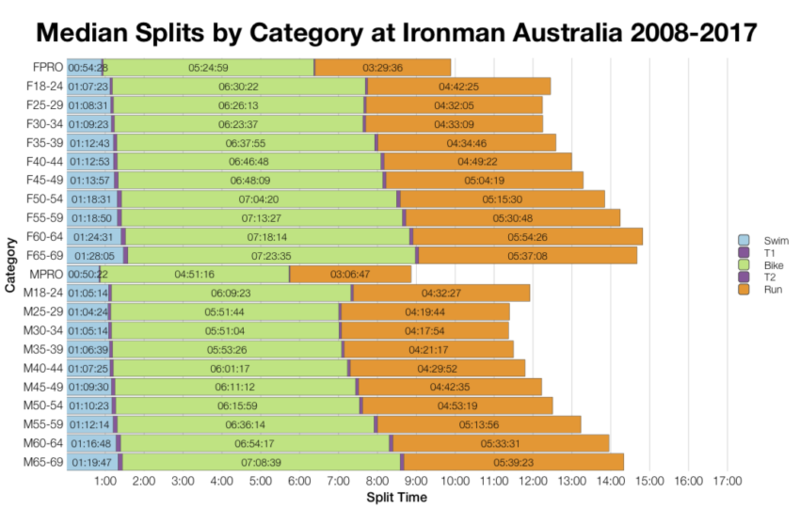 Ironman Australia took place this weekend. 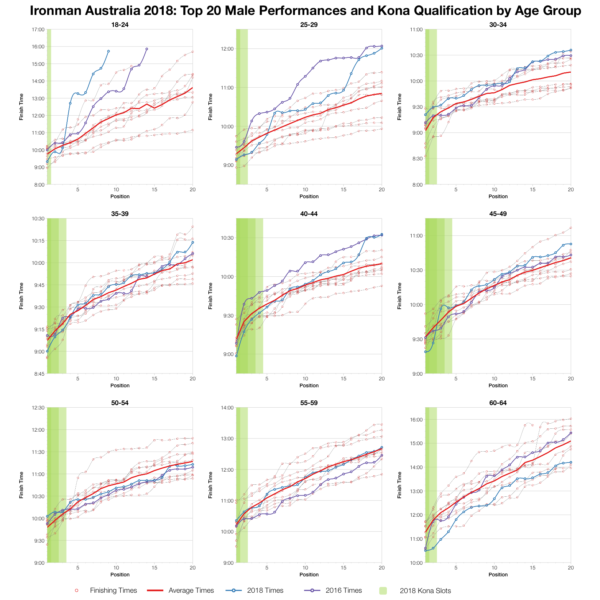 It’s a long standing, mid-sized event that offers 40 Kona slots to its age group athletes. This year’s results look to be typical for the course trending a little slower at the middle of the field, but maintaining competition at the front of the pack. All three stages trend slightly slower at this year’s race when compared with the ten-year data. The changes are all moderate and although this adds up to a bigger impact in the overall splits, it’s not a significant shift. The impact is more at the middle of the pack and back than at the very front. Although the DNF numbers for this race are towards the higher end of the range for this course, they’re far from extreme and suggest conditions were reasonable on race day. There’s some variability in how age group medians compare and not all divisions have slower median bike or run splits at this year’s race. 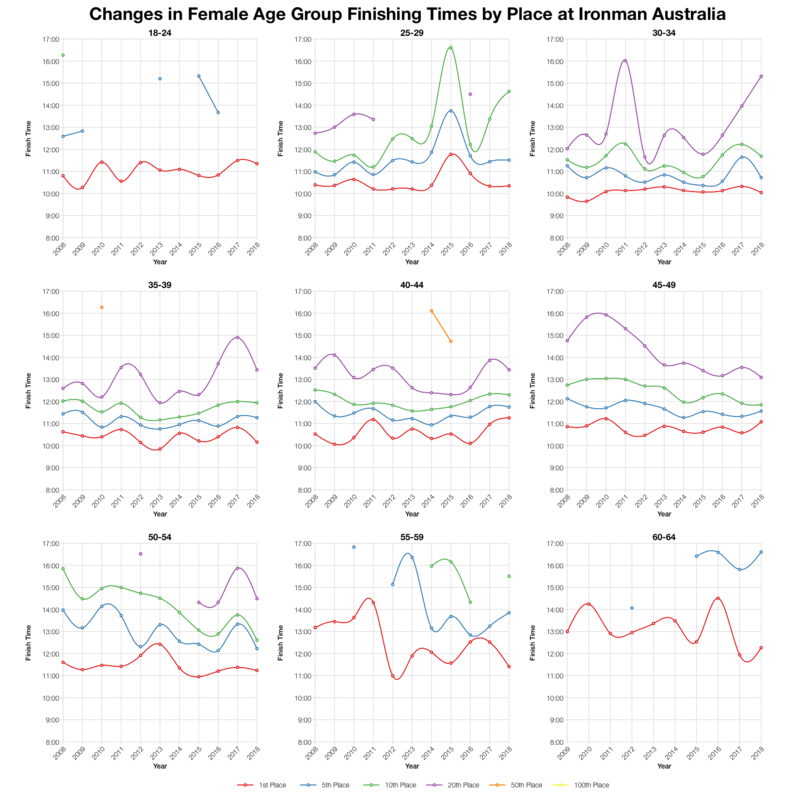 While some age groups were more inline with past results than others, the overall trend is towards a slightly slower race. 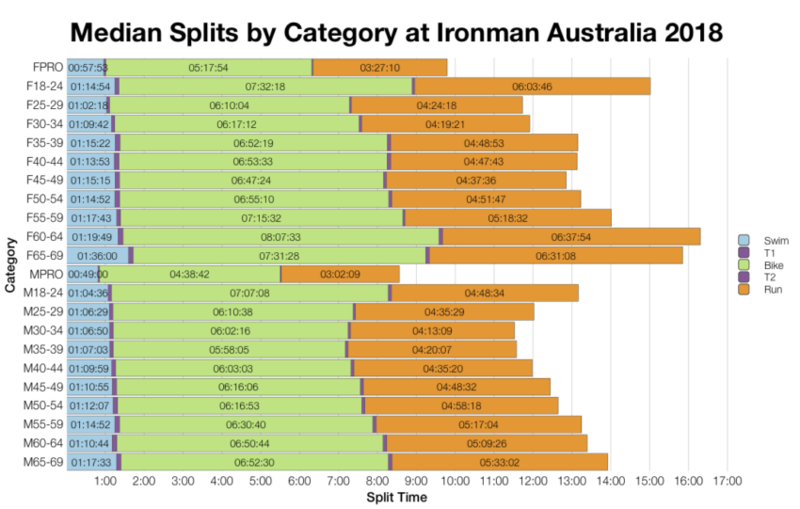 Ironman Australia pulls in a reasonable number of other nationalities to the race, but the majority of the slots remain in Australia. 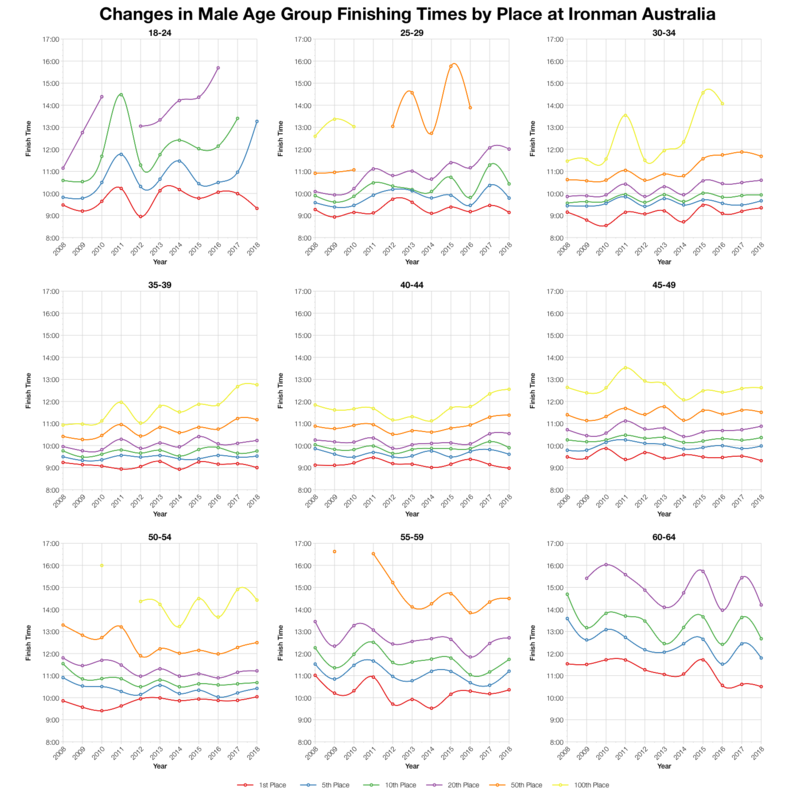 Comparing age group positions over time shows that this year’s race doesn’t diverge much from previous years. 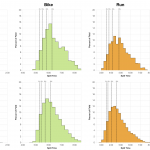 More specifically we can see both how changes in times do vary a lot over age groups, but also position. 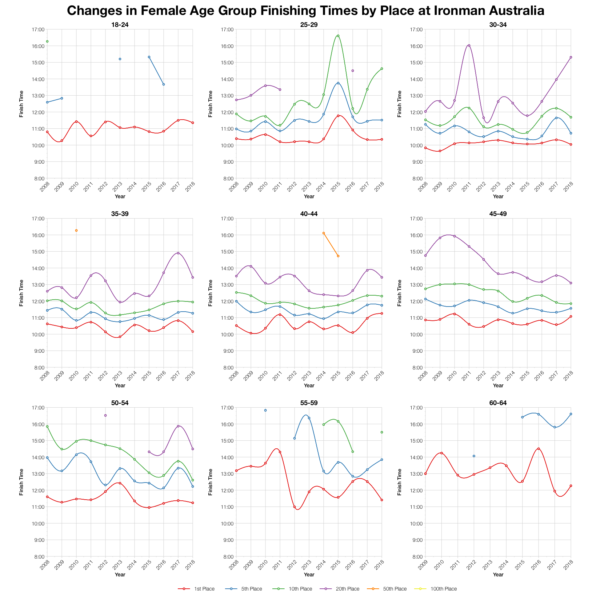 As noted, times at the front aren’t too different to previous years, it’s further back where there’s more change, often with a slightly slower time than recent races. Based on the start list I’ve estimated the Kona slot allocation and from that the automatic Kona qualification times. Final numbers may vary and roll down will affect the qualifying times too. You can review times for every Ironman race on my Kona qualification page. There’s a lot of variability over the top twenty age group times. 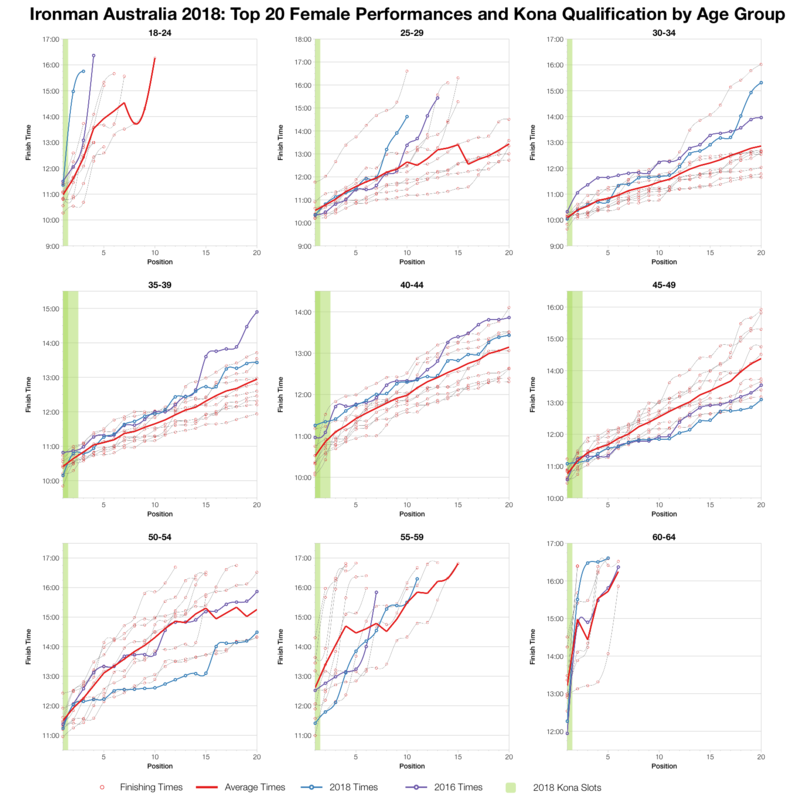 For the biggest age groups though the times are very close to the average at the front of the pack and qualification times tend to fall in line with past results too. 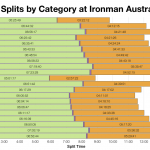 You can access a spreadsheet of the full results from Ironman Australia 2018 on my Google Drive.